“Talk less” is the motto of Jackie Chan‘s noble rogue, Ma Yuan, leader of the Tiger group of rural Chinese pillagers who earn their swag by cleaning out passenger trains in Japanese-occupied China. The Tigers are a jovial, carefree bunch who make snapping the necks of Japanese soldiers look like a barrel of laughs. These patriotic peasant folk exhibit all the plucky hallmarks of your typical Beijing-backed Jackie Chan action hero. Whether he’s battling the might of the Japanese army, or dynastic rule in China (1911) or the ancient Romans (Dragon Blade), these nationalistic films tell of the everyday struggle of ordinary Chinese against overwhelming oppression, and their selfless acts to help restore China’s sovereignty and pride. 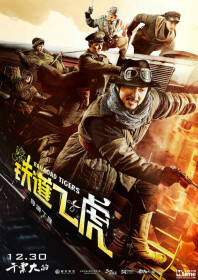 The Tigers decide to put their meddling to good use and take out a crucial railroad bridge used by the enemy in a premise lifted from Hemingway’s Spanish Civil War novel, For Whom the Bell Tolls. The film has a quick-step and a lightness of touch with director Ding Sheng (marking his third collaboration with Jackie Chan) cutting between the action at such rapid speeds that his set-pieces threaten to become unmanageable. Good chemistry between the cast keep things afloat, if not always coherent; most notably between Chan and his son, Jaycee, who share one of Jackie’s best slapstick routines for a long time and a few knowing lines of dialogue. The problems mostly relate to a lack of real characters. There is a telling moment during the outtakes in which Chan and other cast members are shown to have forgotten their character’s name. Despite a lengthy set-up in which every new character is introduced with their name flashing up on screen, there still isn’t a single rounded character among them. It means the action – although full and fast – lacks any genuine peril. Even the icy, imperial presence of two comic-book-evil Japanese generals is never fully realised. This is particularly true of Hiroyuki Ikeuchi, who is even shown to be a karate expert, but the climactic martial arts showdown never quite materialises. The film is unsure whether it wants to be a rollicking adventure film or a poignant war movie. As a result, it’s not quite either of those things. But there is some fun to be had, just don’t go expecting Project A. Looking forward to seeing this, and your review did well to make sure I didn’t get my hopes up as I did for such movies as Ice Man with Donnie Yen. Do we know when this will hit DVD since the closest theatre to show it is a couple hundred miles away.